Whether you are having a family gathering, hosting game night or movie night, the Myleene Chestnut Sofa & Loveseat Set is ready to meet your needs. The Myleene collection is covered in a plush bonded leather upholstery in chestnut brown with contrasting baseball stitching which adds a touch of style. 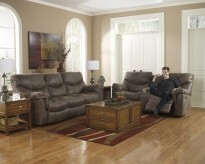 The sofa has a flip-down table with drink holders and storage drawer. 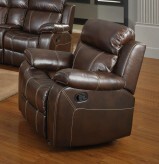 The loveseat features a storage drawer, center console with storage and drink holders and two glider recliners. 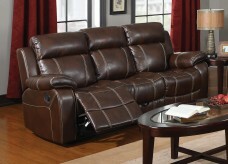 Furniture Nation is proud to offer the Myleene Chestnut Sofa & Loveseat Set online. 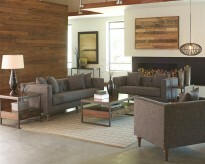 We serve customers across the DFW region including Richardson, Lewisville, Frisco and many more. 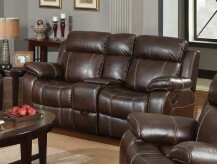 Myleene Chestnut Sofa : L85" x D37" x H40"
Myleene Chestnut Glider Console Loveseat : L76" x D37" x H40"